What do you do when you have leftover holiday ham and guest in your house? 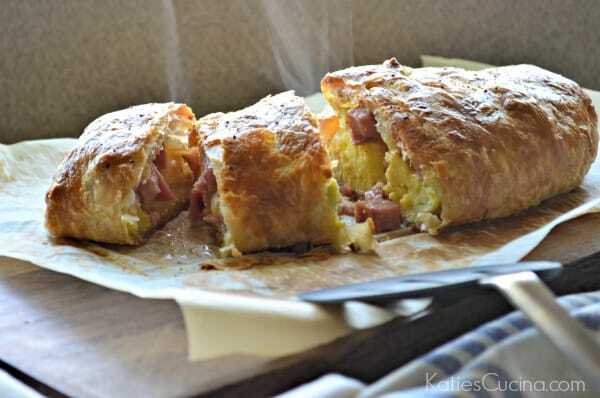 Make my recipe for a ham, egg, and cheddar cheese breakfast pastry for everyone to enjoy for breakfast the next day. It feeds up to 6 adults and uses up one cup of leftover ham. I love using puff pastry, but most of the time I forget that you can uses it to make breakfast pastries. You can fill puff pastry with just about anything–that’s what is so great about it. Extremely versatile and an ingredient that I feel everyone should keep in their freezers. You can thaw the puff pastry the night before in the refrigerator or let it sit out on the counter an hour before cooking with. I like to keep breakfast simple when entertaining guest. I want to spend more time with my guest than in my kitchen. 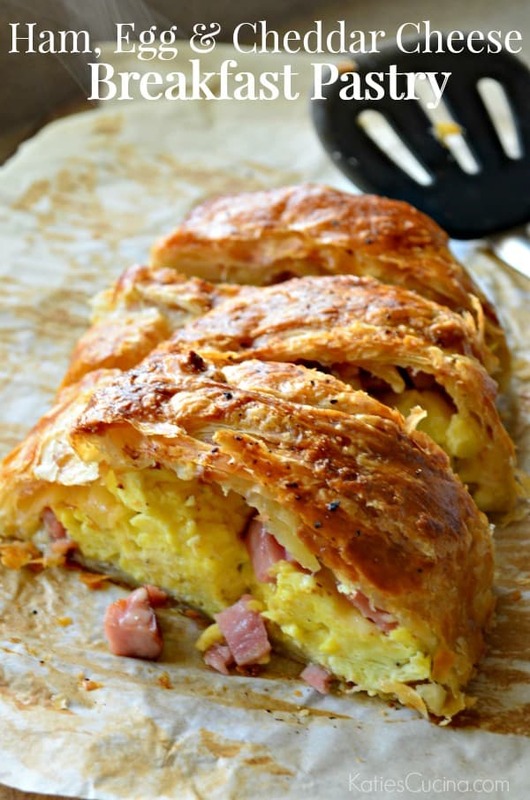 So making this ham, egg, and cheddar cheese breakfast pastry fits the bill. I don’t count the thawing the puff pastry in my prep time for this recipe. Because your not actively prepping the pastry, so just a heads up. By the time your oven preheats your breakfast pastry should almost be done prepping. 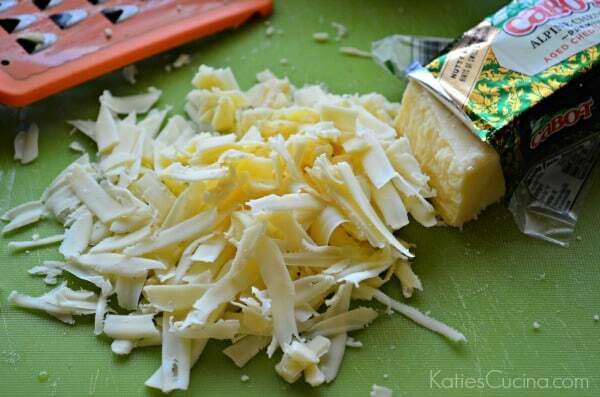 I used Cabot Alpine Cheddar in this recipe. I love it’s nutty and smooth taste and it gives hints of Swiss and Parmesan so I feel like it’s a multi-flavor cheddar cheese. I thaw the puff pastry on a sheet of parchment paper that I can easily transfer to a baking sheet. If you’ve ever worked with puff pastry you know it’s almost impossible to move once it’s filled. It’s stick and hard to handle. Plus, once the pastry is cooked you have easy clean up with a single wipe of your cookie sheet. Not scrubbing and scrubbing the cookie sheet to get all the baked residue off. Let’s talk about assembling the breakfast pastry. It’s very easy. You’ll roll out the puff pastry on a piece of parchment paper, so that the puff pastry is rectangular in shape. Place the scrambled eggs in the center of the puff pastry. Then top with cubed ham and shredded cheddar. Next up, you’ll fold the top end into the eggs and then using the parchment paper fold the right side on top of the cheddar cheese stretching and pulling the puff pastry as much as possible to the other side. Fold the bottom end over, and then repeat by stretching and folding the left side over to the other side of the puff pastry. Make sure you cut a few slits on the top so that the puff pastry so that it can breathe. Make an egg wash and coat the top with the egg wash so that it will become a beautiful golden brown. I also like to sprinkle a little salt and pepper on top. 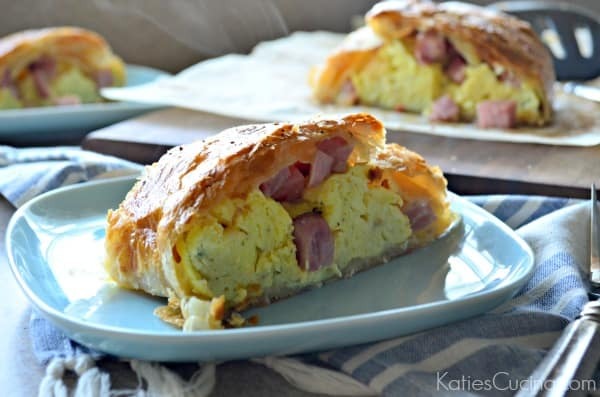 If your entertaining this holiday season, or simply want a way to use up leftover ham I highly suggest you give my recipe for ham, egg, and cheddar cheese breakfast pastry a try. Your family and friends will love you and be begging for the recipe! While oven preheats make the scrambled eggs. Mix together 6 eggs with chives, heavy cream and salt and pepper to taste. Preheat frying pan and melt unsalted butter. Scramble eggs until fluffy. Remove from the heat and set to the side. Roll out the puff pastry on a piece of parchment paper so that the puff pastry is rectangular in shape. Place the scrambled eggs in the center of the puff pastry. Then top with cubed ham and shredded cheddar. Fold the top end into the eggs and then using the parchment paper fold the right side on top of the cheddar cheese stretching and pulling the puff pastry as much as possible to the other side. Fold the bottom end over, and then repeat by stretching and folding the left side over to the other side of the puff pastry. Cut 5 slits in the top so that the puff pastry can breathe. Beat one egg in a bowl, using a brush, brush on the egg wash. Pick up the parchment paper that has the breakfast pastry on it and place it on a baking sheet. Place in the oven and bake for 25-30 minutes or until golden brown. Let rest for 5 minutes and then slice into 6 pieces. Enjoy immediately or store in an airtight container in the refrigerator for up to 3 days. To reheat just place in the oven on 350 for 10 minutes. Agree with you on the versatile puff pastry. Been cooking for a long time and was afraid it would be like too delicate. Like making Baklava with phyllo dough. So not true. Thanks for another way to use it! Happy New Year and hope your Christmas was lovely!! Yes— love working with puff pastry and phyllo too! Yes! You will love this breakfast pastry!! !